It took a little while but spring is finally here, and with it they come the sunniest & hottest months of the year. During this season we try to spend as much time as we can outside to enjoy the beautiful days, and while we're having so much fun (in the sun! ), sometimes we forget to do the most important thing: to drink water!! 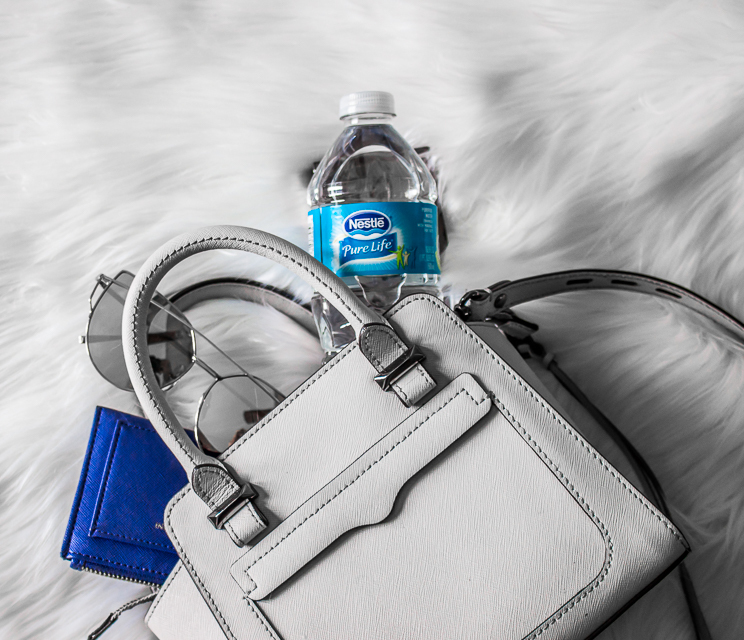 I'm sure most of you have this problem, so today I'm partering with Nestlé® Pure Life® to talk about some tips to stay hydrated. La primavera se tardo un poco en llegar, pero finalmente estamos disfrutando de dias super soleados y tambien calurosos, y aprovechando el mayor tiempo posible afuera. Lo unico malo es que durante estod dias tambien se nos olvida lo mas importante: Tomar agua!! Estoy segura que a ustedes tambien les ha pasdo, por eso hoy estoy colaborando con Nestlé® Pure Life® para hablar de algunos tips para mantenerse hidratado esta temporada. 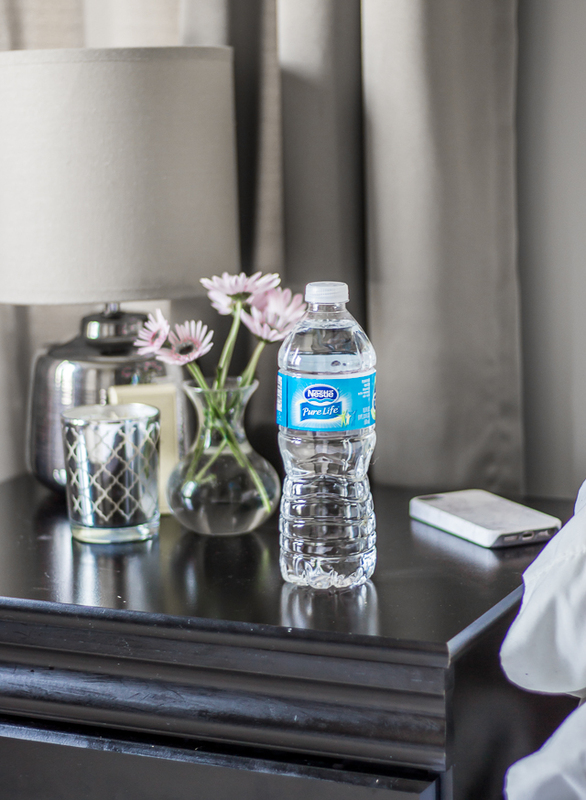 Keep some water on your nightstand. Your nightstand is the last thing you see before you go to sleep and right after you wake up. By keeping some water there you'll remind yourself to drink eventually it will become part of your morning routine. I'm not a big fan of leaving a glass of water on my nighstand because I feel the water gets "dirty" overnight, and I have a nosy cat that likes to drink from glass cups each time she has the chance, so I rather play safe and use a water bottle instead. La mesita de noche es la ultima cosa que ves en la noche y lo primero que ves al despertar. Cuando tienes un vaso o botella de agua en tu mesita al despertar te hara recordar que debes tomar agua y despues de un tiempo se volvera una rutina. Yo prefiero utilizar una botella cerrada en vez de un vaso porque siento que el agua en el vaso puede "ensusiarse" durante la noche. How many of you don't drink water because you don't like the flavor? 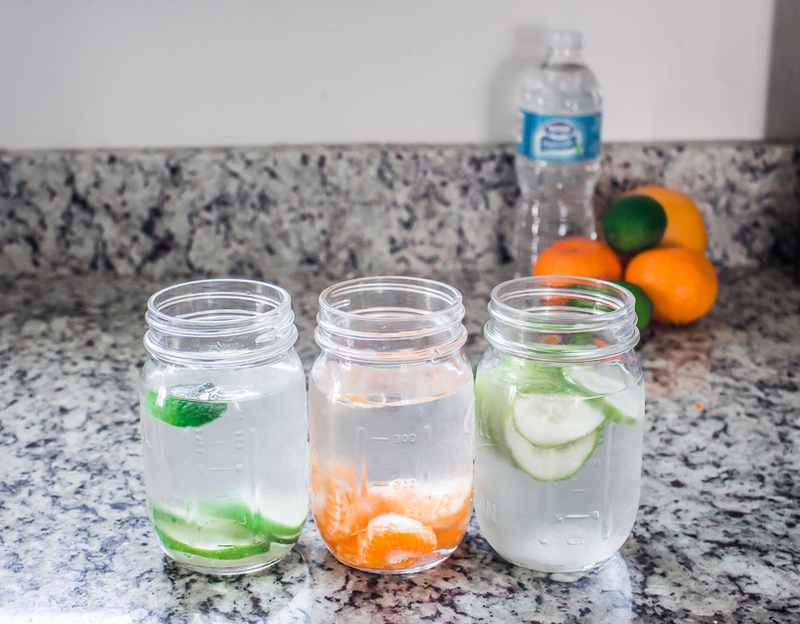 Infusing your water with fruits and veggies will add some flavor and it'll make drinking water easier. I prefer Infusing cucumber or citrics but other combos I love are: lemon + mint , watermelon + basil, or strawberries +blueberries. Cuantos de ustedes no toman agua porque no les gusta como sabe? Una buena opcion para que sea mas apetecible, es agregarle frutas naturales para que tenga un mejor sabor. A mi me gusta usar pedacitos de pepino o frutos citricos, pero otras combinaciones que me gustan son : limon y menta, sandia y basil, o fresas y moras. There's nothing better than having a cold drink when you're thirsty. I cannot count how many times I've chosen soda over water just because I wanted to drink something cold. And easy hack for this problem is to always keep my fridge full of watter bottles. When I go to my fridge and the first thing I see is cold water, I'll grab it! 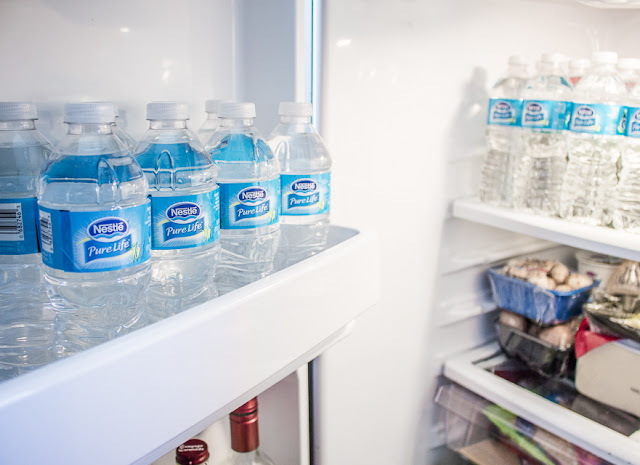 These Nestle Pure life Water bottles are a great option to stock your fridge with, their size is just perfect for the side shelves. Nestle just relaunched their packaging and now you can get their new Nestle Pure Life 35-pack for the price of their old 32-pack. You know I'm a big fan of anything savings so I had to let you know! No hay nada mas rico que tomar una bebida super fria cuando tienes sed. Tengo que admitir que muchas veces he elegido refreso en vez de agua solo porque queria tomar algo frio y eso era lo que tenia en ese momento. Un truco sencillo para evitar que esto te pase es tener agua fria en tu refrigador todo el tiempo , asi cuando abras tu rerigerador buscando una bebida y lo primero que veas es una botella de agua seguro esa sera tu primera opcion. Yo lleno mi refri con estas botellitas de Nestle Pure Life , que por cierto ahora puedes encontrarlas en el paquete de 35 piezas que cuesta lo mismo que el de 32, ya saben que a mi me encantan las ofertas asi que tenia que contarles sobre esta ! The main reason why we don't drink enough water when we're not at home is because we don't have it with us. Get the habit to always carry a small watter bottle with you, that way you don't have any excuses not do drink it! 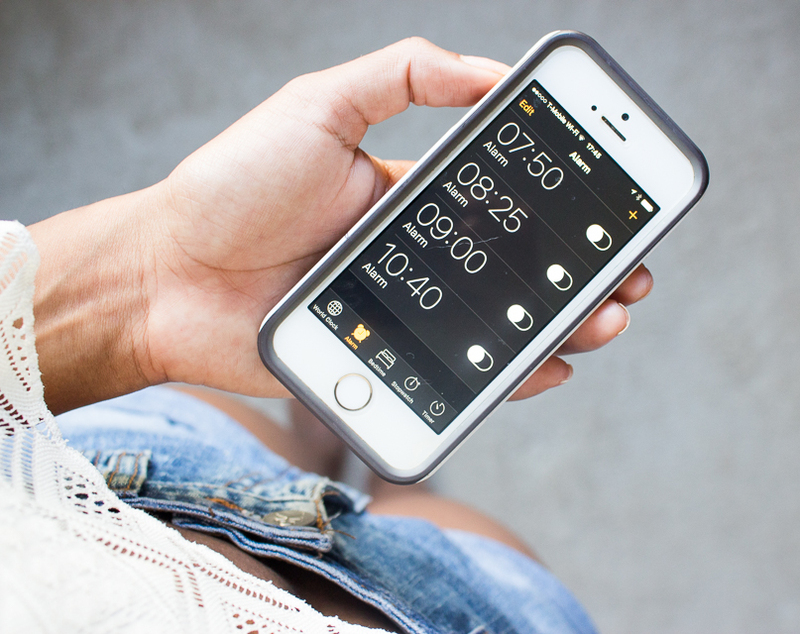 If you have done all of the above but you're still not drink enough water then, set up some reminders on your phone. Each time your alarm goes off, drink a glass of water. Pon recordatorios en tu celular. Are you ready to do this tricks and start drinking more water? If so don't forget to snag yout take Nestle Pure Life 35-pack from Walmart. At the moment the 35-pack is not available on the website yet (only the 24-pack ), but you'll find it in the store at the Bottled water section. If they don't have it in your local Walmart, just ask a store manager about getting the product in your area. Ya esta lista para seguir estos consejos y tomar mas agua? 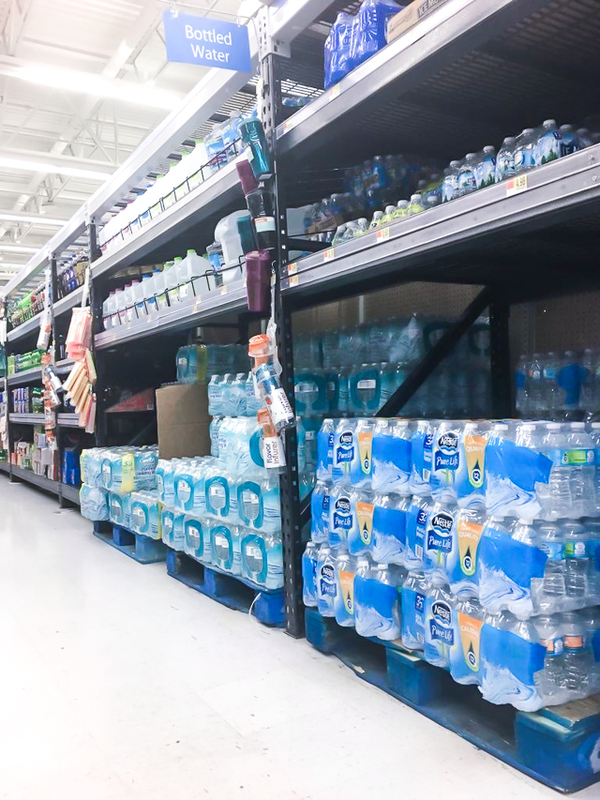 Entonces no te olvides de ir por tus botellas de Nestle Pure Life a Walmart. Por el momento el paquete de 35 piezas no esta disponible online (solo el de 24), pero puedes encontrarlo en la seccion de agua embotellada en la tienda. Si no lo tienen en ese momento puedes preguntar a algun manager en que locacion lo tienen disponible. 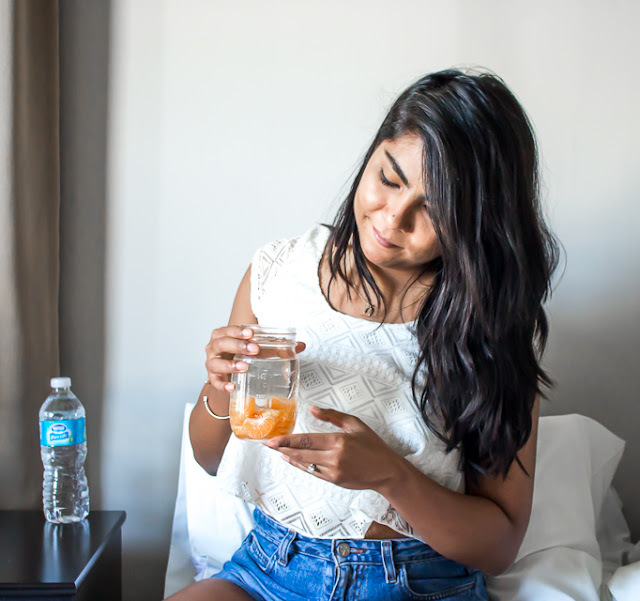 Do you have any other tips to stay hydrated or to drink more water? Please share them with me in a comment below! Tienes algun otro consejo para tomar mas agua? Compartelo conmigo en un comentario!